The California Wine Institute is celebrating with their 8th Annual Down To Earth month. Throughout April there are events and activities across the state from wineries who practice sustainable winegrowing, winemaking and farming practices. These include producing high quality grapes and wines, protecting the environment, being a good neighbor and employer, and maintaining a thriving, long-term business. I will feature an interview on my radio show on Saturday, April 13th with Allison Jordan, the Executive Director of the California Sustainable Winegrowing Alliance. Also joining me will be John Olney, the Chief Operating Officer and Winemaker at Ridge Vineyards, Lytton Springs. The discussion will explain sustainable practices, we’ll touch upon some of the 50 events, and you’ll hear about Ridge Vineyards’ celebration of organic farming on April 20th. Both locations, Lytton Springs in Healdsburg and Monte Bello in Cupertino, will participate. On this show you’ll learn about the Slow Wine movement. 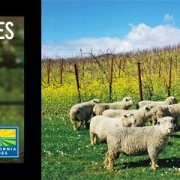 Very much like the Slow Food movement, it awards wineries and vineyards who make wine and farm sustainably. I’ll talk with Ann Baker of Larkmead Cellars and Ted Lemon of Littorai Wines. Both are featured in the 2019 Slow Wine Guide. Events have already begun so I wanted to help you get a jump on where you can go to join in on the celebration. Click the map below to be taken to the Wine Institute’s California Wines’ press release about Down To Earth Month. Celebrate Earth Day with wine!